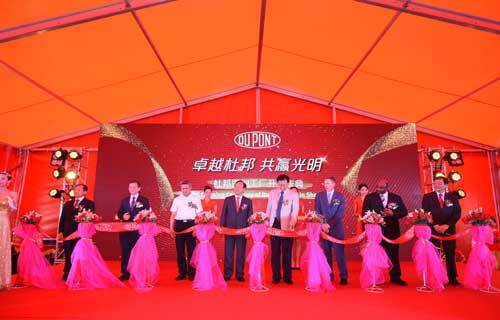 On July 19, DuPont has officially inaugurated its largest compounding site in Guangming New District, Shenzhen, China. Products to be made at the site include Zytel polyamide (PA), Crastin polybutylene terephthalate (PBT), Delrin polyoxymethylene (POM) homopolymer, Bynel adhesive and Fusabond resins, etc. Not only it is DuPont’s largest compounding plant around the world, the company said it has invested in the most advanced extrusion technology to improve flexibility and delivery time. “This investment shows our intention to fulfill the increasing demand of the customers. The new site offers higher capacity and allows us to respond to the changing requirements flexibility and quickly,” said Randy Stone, President, DuPont Performance Materials. Referred to as the Apollo project, DuPont will shut down its former site in Shenzhen and shift its production to the new plant. “China is the largest market of DuPont Performance Materials, and Asia is where our business grows fastest. The new factory is an important asset to achieve our promises to the market,” added Tony Su, President for the DuPont Asia Pacific region.